I had been on Bibi’s porch for more than a month. I loved that I could see everything outside because of all the glass windows. I could see three dogs that couldn’t get me. I could see so many birds who talk to each other and I could hear everything they say all day long. So many bird sounds at once! I don’t know what they are saying. I think they are talking about what to eat and if there’s anything dangerous to tell each other about. At night crickets and frogs and bugs sing for me. They sound very different. Once there was a big thunderstorm and the sky kept lighting up. I wasn’t scared but it was very loud and the sky was throwing so much water at us. I was safe on my porch. Some nights Bibi sits next to me and we look up at the stars and the moon. It’s almost like we’re outside. It turns out I DO want to go outside! I changed my mind. I am not so scared anymore. 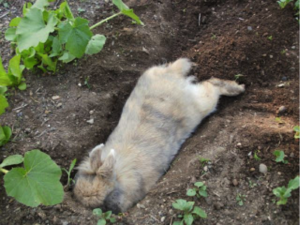 I remember the good things about when I was pretending to be an outdoor rabbit. Even though Bibi picks me fresh dandelion, clover and grass twice a day I want to pick them myself. And I need to dig some holes. One early morning it was so beautiful outside that Bibi took me to the vegetable garden in a little bag. I loved it so much. I hopped and leapt and dashed around and around and I was extremely happy. It’s my playground now. I have several projects going on. Here you can see my rabbit holes that I dig. I do a special thing that cats and dogs don’t do. 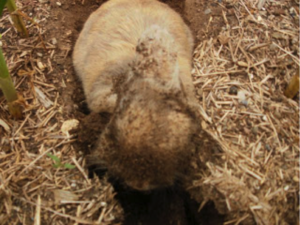 After I dig dig dig I turn around push away the dirt I just dug so I can keep digging deeper. 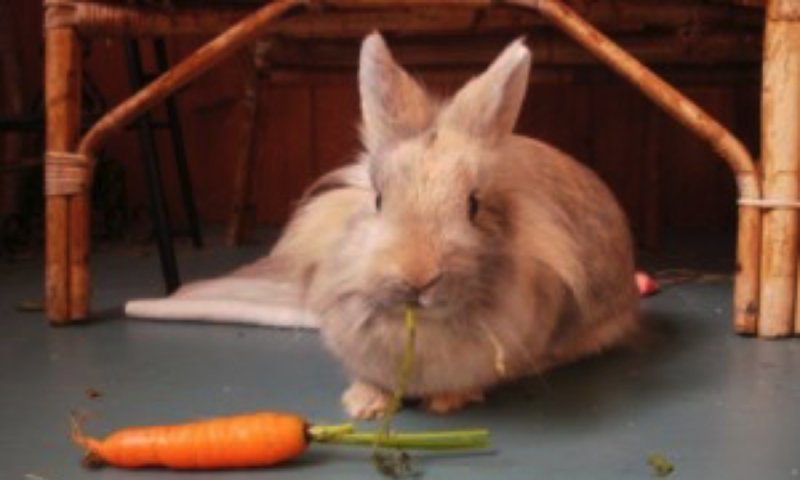 Rabbits are better at making secret tunnels than cats and dogs are because of this trick. 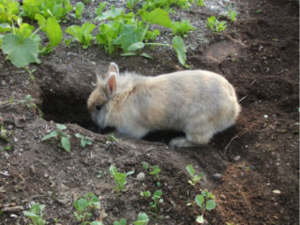 I have started four different rabbit holes in my garden. See I got my face got dirty when I was working! Then I like to run around a lot. I really kind of leap through the air in the garden and I pretend someone is chasing me! Sometimes there are cats and dogs outside the fence… I run around very fast like crazy even though they never can get me! 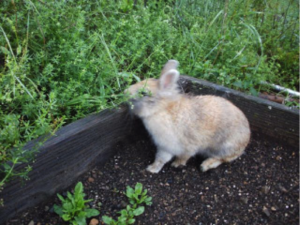 Mostly I get a belly full of weeds when I play Bunny In The Garden. There’s almost no weeds I don’t like. Grass and old dead grass are some of my favorites. Dandelion, and clover is good. I even ate poison ivy which is supposed to be very bad for me but I loved it and I was fine. I find new things all the time. Like leaves of string bean plants. Flowers from bolted mustard greens. Leaves of wild strawberries. I always find different little things and Bibi goes and picks them for me once she knows I like them. But not poison ivy! I did try a raspberry one day and I liked it but I like the leaves and stems more than the little sweet red part. People only like the sweet red part. 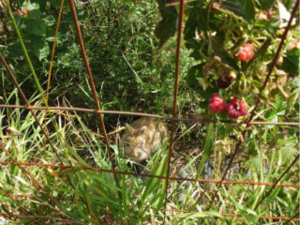 Can you see me hiding in my raspberry jungle? I like to be here for hours all by myself! Sometimes I want to be picked up and snuggle even when it’s Bunny In The Garden playtime. If Bibi is weeding and is on her knees, she might feel some little paws on her back and she turns around and it’s me! Bibi thought I could run around in there and have a playground to myself because the holes in the fence are much smaller than me. But I really wanted to get out one day. 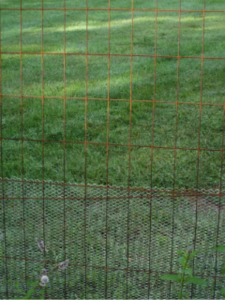 I tried to get out through that fence– I stuck my head and arms out through and couldn’t make it so then I wiggled back. I had to clean my whole self after that. But I tried again- and this time I got my whole self through the fence! It turns out I can make myself half my size! It’s like a little magic trick we use when we need to get somewhere that’s too small. I didn’t go far I just hopped around, around and around the lawn, and a little bit into the woods. I also disappeared under Bibi’s neighbor’s house where I used to live. The dogs came after me but I can hide in smaller places and I can run faster. 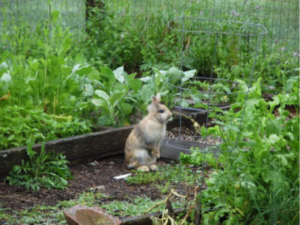 I was the only rabbit that day trying to escape AWAY from a blooming vegetable garden. I stayed out all day. Bibi had been trying so hard to get me for a long time – she even set my trap with my favorite: bananas and dried apricots. Bibi kept calling me and saying she loved me and she kept saying Sandra come home and sometimes she was crying. But I was just having a really fun time. After all day I was getting a little tired myself. Bibi sat down on the grass. So I ran up to her, she pet me and was so happy and I let her scoop me up and we went home. I drank water and ate my pellets and fell asleep. The next day she fixed it so I can’t ever get out again. Sometimes I do want to be an outdoor bunny. But you can only be a real one if your mommy was one and she could show you. I was pretending I was a real outdoor bunny before Bibi found me. I think it was too hard. 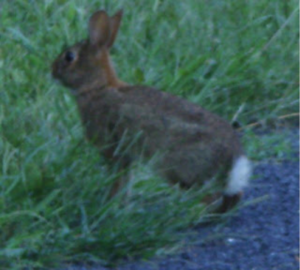 Here is a picture of a real outdoor bunny. They all look the same and they all look like that. He WISHES he could get into our garden. 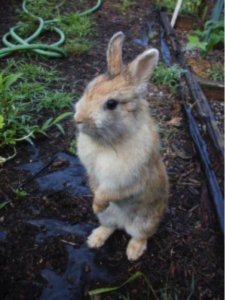 But when I play Bunny In The Garden I can pretend, sometimes all day. 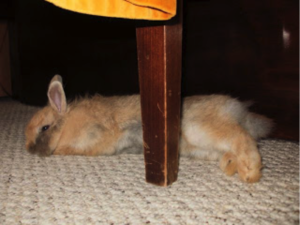 Then I want to go home, clean myself up and sleep a little where there’s no dogs or cats and and wake up and eat my pellets and relax and just chew my apple twigs for awhile.